In a previous post we looked at using BIML to execute a stored proc in order to assign a return value to a variable in BIDS. The use case for this is pretty simple, when we execute a package, we want to get an ID for the execution and then record execution information against that ID. When we execute packages through a master and child arrangement, we need to do two things. Firstly, the master package gets an execution id (to record the batch) and secondly, each child package execution gets its own id (relative to the parent) to record its own execution. This is the classic application of header / detail relationships as seen in the following diagram. There are a few things to remember here so I’ll break each out into its own paragraph. I’ve been over some of these points before but they are worth inclusion nevertheless. The 2 BIML files can be executed together by selecting both, right clicking and selecting the ‘Generate SSIS Packages’ from the popup window. The ability to do this is required because a biml snippet (for example the connection string) is defined in one code file and referenced in the other. 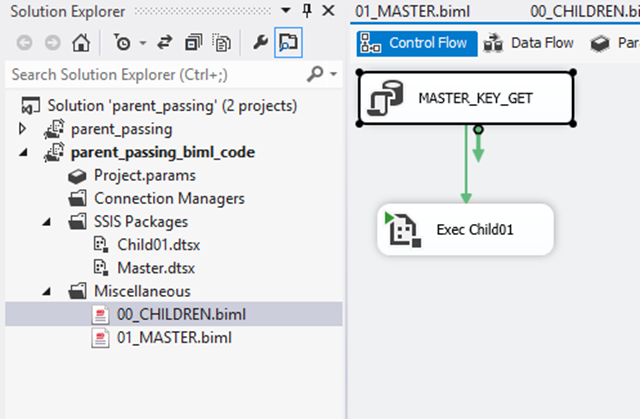 Naturally, the execution order is important (note the connection is defined in child) so we want to compile that (child) package first. The use of the keyword ‘tier’ in the directive of the file determines the order of compilation for selected packages. We can define a variable or parameter within in required scope through the tree structure of the XML document. I’ve scoped these variables to the package (they are declared directly under the package node), however, if I wanted to restrict the scope of a variable to a container, I could declare it within the containers XML nodes.